Gastrointestinal complications (GICs) following cardiac surgery are often severe and contribute to substantial morbidity and mortality. The diagnosis of GICs remains difficult because symptoms and signs are often subtle, or nonspecific, and this commonly leads to delay in definitive diagnosis and treatment. Preventive strategies, coupled with early recognition and aggressive management, provide the foundation of the general clinical approach to addressing these complications. Overall, a high index of clinical suspicion and a low threshold for investigation and definitive management are recommended in patients with nonroutine clinical progress after cardiac surgery. 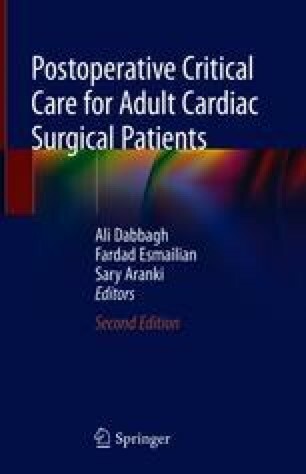 It is imperative that all clinicians who care for postoperative cardiac surgical patients be familiar with the full spectrum of potential GICs in this patient population, as well as the general therapeutic approaches to these complications.